My passport is a reminder of the occupation. It looks innocuous. 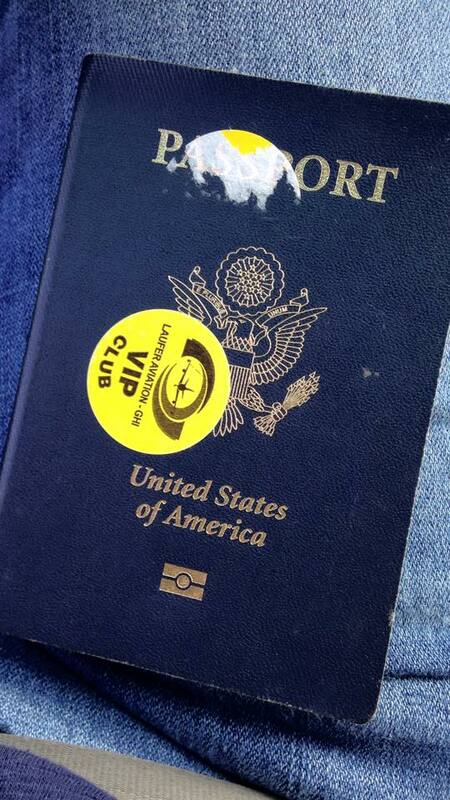 A little yellow sticker, VIP even. Laufner aviation. Wait, aviation? Many people complain about airport security in America. You've got to show up hours before your flight, be subjected to X rays, take your shoes off, take out your computer, etc. But then you're through security and on your way. It's not so simple when you visit Palestine. If you possess an American passport you can fly into Tel Aviv, in theory. But so many people who are active within the Palestinian cause are detained in the "VIP room" and returned to their country of origin, at their own cost, after hours of grueling interrogation and humiliation. So not many people go that route. Even if I would have wanted to fly to Tel Aviv (Yaffa) I wouldn't have been able to because my husband and his family have a Palestinian ID. It doesn't matter if you have a U.S. Passport if you also have a Palestinian ID anyway, you still have to use the Palestinian ID. Since I was traveling with my family we went to Palestine the only way Palestinians are allowed, through the Allenby Bridge/King Hussian crossing, more commonly referred to as the bridge. I had no idea what to expect at the bridge. There is really no way to prepare yourself for your first glimpse of the occupation. In preparation for my trip I deactivated my FB and several other social media accounts. Most of my accounts had a picture of my husband and I with a Palestinian flag in the background (which I learned from a Google search of myself) except my FB. I had stopped using a photo of myself on FB 6 months before my trip to protect myself. These might seem like extreme measures to take but I can assure you they are not. In fact around the same time I was traveling to Palestine several more well known activists were refused entry to Palestine, by Israel, because they wouldn't allow the soldiers to access their private FB messages and texts. Our experience of crossing from Jordan to Palestine via Israeli security was an all day ordeal (and we were lucky because it wasn't even busy) that I will do my best to describe briefly. We drive from Amman to The Bridge. (It's more like a road than a bridge but I wasn't consulted for the name so we'll have to use the commonly accepted term) on the Jordanian side we pay extra (like ridiculously more) to travel VIP. This makes the process go more expediently. While a porter (for lack of a better term) takes all our passports and handles all the paperwork we sit and wait. At one point he comes back to us and realizes he is missing a passport and leaves to find it. Like any normal person traveling in a foreign county I am totally freaked out by the missing passport but I try to stay calm until it is resolved a few moments later, without any intervention on my behalf. After they've processed all our paperwork and taken our money we are escorted to the VIP buses, which are really just big vans. The whole point of paying the extra fee for VIP is these vans because as soon as our paperwork is processed we are on our way without waiting for the other seats to be filled. I mean we pretty much filled them all anyway since we were traveling with Feras's brother and sister but it was definitely preferable because the regular buses seat about 60 people and who knows how long it would take for that to fill up. So we climb into the conversion van with our driver who is making plans to purchase concert tickets on his cell phone. I wanted to say something along the lines of "Ever heard of BDS?" but being surrounded by soldiers, razor wire, guns and god knows what else took the fight out of me. I did think it was weird that the driver had the passports but since we had just counted them all and made sure we had them before we left the Jordanian side I didn't pay close attention. Besides the whole drive took like 5 minutes anyways. So we get to the Israeli side. First we have to go through security on this side. The driver gets out and unloads our bags and tells me that the kids and I will likely be separated from Feras and his siblings because of our American passports and their Palestinian ID's. It might not sound like a big deal but I was terrified since there really is no telling how accommodating anyone is going to be to me, and if they even speak English since most conversation around me is in Arabic or Hebrew. My brother in law takes the passports and heads up to the first window. Another porter helps us with our luggage while we stand in line off to the side. After a little while, there's really no telling how long since time seems to stop while you're standing outside in 100+ degree weather with small children waiting on the army. He comes back from the first window and immediately proceeds to a window behind us. So far they are letting us stay together, "how lucky are we?" I think. At this window we are each called over and our names are matched to our passports. We had to hold Adam and Samir up so that the guard could see them but not Leila. Of course not, she's the lightest one. We are then escorted to the third security window we need to go through since taking the short car ride. Fourth total security so far. The nice thing about all of this is that they are letting us all stay together and taking us exactly where we need to go. While not an easy process I'm relieved things seem to be going along smoothly. After going through the third security, complete with metal detectors and questions about why we are visiting Palestine we are finally given back our passports, which had gone from the hands of porter to guard to porter several times. We were also told to step to the side so that we can answer additional questions. Awesome. Now I may tease my uber cool brother in law about his traveling fanny pack but he's definitely got this whole border crossing thing down and I'm thankful I'm not the one taking the lead this time. As he is organizing everything he counts the passports. 6 passports. We count the people. Seven people. Six passports for seven people? Nope not possible. Who's passport is missing? Leila's. When the official comes over to ask us additional questions we quickly point out that we are missing a passport and ask for help. Do you know how she helped? She told us we could go ask the last security person we went to, who was not helpful or even polite. As if it's my fault that she didn't do her job properly and notice a whole extra human being, a palestinian one at that, entering the country. Since she didn't have the passports the questioning official very tersely suggests that we check the suitcases in case we mistakenly packed it. Because that's how I roll, I like to get halfway through border control and then tear open my suitcases and hide my daughters passport. Mwahahahaha now you know my evil plan. After convincing this woman by checking all of our bags in front of her (that we had physical possession of, we were finally able to convince her that there was no way we put the passport in the luggage) she finally agrees to let us go back to the previous windows to find the passport. She doesn't help us at all but at least she doesn't stop us. We had to go back to the first window on the Israeli side where my brother in law finally saw one little lonely American passport just sitting off to the side. No one even made an attempt to page us or use the fancy walkie talkies that everyone had on their hip. I mean it's just a foreign passport, no big deal, right? After that whole ordeal was over we had to go through the next security screening/passport control. And what a surprise, they have questions. It's really just the same questions by multiple people over and over. Where are you going? Why are you going? Who are you going to see? Why are you going to see them? Who are your relatives? What are their names, addresses, phone numbers? We were lucky because the soldier who asked us these questions was an idiot. For reals. Guy didn't know where Nablus was. Or Tulkarem, or Ramallah. I used to be a hospitality manager so being nice to ignorant, asses is pretty much a specialty of mine and we were allowed through. To claim our bags and go through one more x Ray machine before finally being in Palestine. I had no sooner heaved a sigh of relief before we had a solider screaming at my sister in law to open her bag. Apparently she had something that looked suspicious on the X-ray. I thought it looked like glitter. So after the soldier was finished screaming and berating Reem for absolutely nothing (I really mean it she opened the bag the lady dug all through it there was nothing) we were finally free. It might sound like a fairly quick but stressful ordeal but from start to finish it took about 10 hours. And the ultimate insult I now have this yellow sticker on my passport as a reminder of not only our experience but also the fact that Palestinians have no airport. I couldn't fly to Palestine even if I wanted to. No one can. But before the occupation you could. And I hope one day you will be able to again. It should also be mentioned that even though my trip was long and stressful it doesn't compare to what the average Palestinian person endures while making the same trip. I got a taste of what they endure on my return home but that's a whole other story. I'm left with the impression that whether you are going into or out of Palestine they want to make the ordeal as humiliating and dehumanizing as possible to discourage you from traveling but they obviously don't do it for security reasons since not one but two separate security points failed to notice an extra person without a passport. Thank you to https://www.facebook.com/MindfulIntifada for letting us share their post !